Angel Falls is the highest waterfall in the entire world with a height of 807 meters. It is also ranked among the world’s four most beautiful waterfalls. It is also one of the least accessible tourist attractions in South America. It is located in the Canaima National Park in Venezuela. This waterfall is named after an American aviator Jimmie Angel. He was the first person to fly over the falls in the mid 20th century. His plane crashed at the top of the waterfall and it took him along with his wife 11 days to descend the tepui by foot. The longest continuous drop in Angel Falls is more than 8 hundred meters. The waterfall splits into two different falls sometimes during the rainy and wet season. Aleksandrs Laime, a Latvian explorer was the first European to reach the base of Angel Falls. He arrived at the base in 1946. The water of these falls evaporates even before touching the ground during the warmer and drier seasons. It is a tricky affair to reach this waterfall. It becomes almost impossible to get a glimpse even from a helicopter on a cloudy day. Under certain conditions, tiny water drop splashes can be felt a mile away from the waterfall. The Canaima National Park is the second largest national park in the Venezuela. Venezuelan leader Hugo Chavez made so many efforts to change the name of the falls to Kerepakupai Meru. The waterfall is surrounded by a thick jungle. It can only be seen when flying by it in a plane or riding near it in a boat. 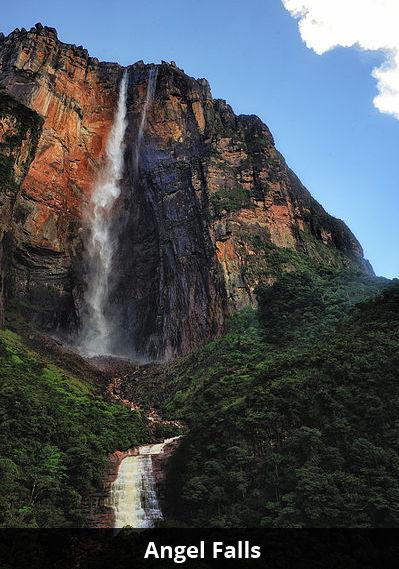 Angel Falls flows from the Churun River and falls over the edge of Auyantepui Mountain. Declan, Tobin. " Fun Facts for Kids about Angel Falls ." Easy Science for Kids, Apr 2019. Web. 25 Apr 2019. < https://easyscienceforkids.com/angel-falls/ >.